Search engines use two types of listings for search results to be displayed. There are paid search result listings and organic search result listings and these come together in Google as shown in the image on the right. The Google Adwords pay per click adverts are at the top of the results in the coloured area shown in our example. Google places a small “Ad” with the listing to show you that these are paid ads. To appear here you have to setup Google Adwords and then when a user clicks on the link to your website you will pay for the click and this can become very expensive. Prices can vary from £0.30 to £100.00 per click so in highly competitive areas you will need a large budget. Depending upon the daily budget of the Adwords campaign your website advert will appear for as long as the budget or campaign settings will allow this and then your adverts stop showing until the next day. 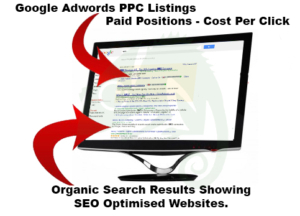 Organic listings are going to appear 24 hours a day, 7 days a week and do not cost if someone clicks on the listing link, so in the long term being in the organic listings is much better. To achieve organic success and get your website listed high in the search results you need Search Engine Optimisation. Search engine optimisation is a complicated process where an SEO consultant will look at your website and understand what keywords you should be looking to achieve and then modifying the website to ensure the content is Google friendly allowing the search engine to find the information on your website in order to rank the website for these keywords selected. A search engine will return the best results for a user based on the keyword that has been searched and the SEO consultants job is to make your website attractive to a search engine to position it in the search results as high as possible. Every website is different and also every website needs to achieve different keywords, some of the keywords are going to be easy to achieve and other very difficult. Normally if a website has very poor SEO optimisation then an SEO consultant can make changes and then force Google to come and get the changes which can result in quicker results than an already optimised website being tweaked. From making changes it normally takes 6 to 9 weeks on average to start seeing movement from not being in Google or pages 10 onwards to getting to pages one to four. To achieve page one listing the SEO changes need to settle as initially, you be seeing what is called a Google bounce. You can try and carry out SEO – Search Engine Optimisation yourself but it is highly recommended to use a trusted SEO Company like Chameleon Web Services to carry out this role for your business. If you are asking the question “Do I Need An SEO Company?” then read the article.